Exciting times ahead for (Amex/TSX: URZ) Uranerz Energy and its shareholders! The company just announced receiving its long-anticipated NRC Materials License; one of the first new uranium-mine permits issued by the United States Nuclear Regulatory Commission in over 20 years! A major milestone over 4-years in the making, this final approval was the last NRC hurdle before the company can now transition from Uranium Explorer to Uranium Producer status. Last year we especially liked uranium and since late 2010 we have closely followed URZ as one of our Featured Stocks. Uranerz Energy is a pure-play uranium company poised for near-term production in Wyoming - America's largest uranium producing state. Uranerz Energy has great properties with an established resource, safe mining district with good infrastructure and nearby production, and with lots of exploration potential upside. The other URZ key for us is that their management really knows their stuff. They are some of the same people who built the world's third largest uranium producer, sold to Cameco in 1998. Same people, same business plan, just a new name - actually even the name Uranerz comes from that company sold 13 years ago. Uranerz Energy's impressive property portfolio covers over 95,400 acres (38,610 hectares or 149 square miles), consisting of over 30 uranium projects located in the Pumpkin Buttes Uranium Mining District of the Central Powder River Basin of Wyoming. Several of these projects, including Nichols Ranch and related properties covered under their NRC mining permit, are adjacent or nearby uranium producers (NYSE: CCJ) Cameco Corp. and (TSX: UUU) Uranium One Inc.. Cameco and Uranium One are two of the largest ISR uranium miners in the world! Uranium mine permitting is an especially complicated, costly and time-taking process. Management's proven skills, and a few key announcements over the last year made us believers that Uranerz Energy might soon win the permitting race to become America's next uranium producer. While several uranium explorers remain at various stages of the NRC licensing process, Uranerz Energy stands apart in that it can now commence construction of its first uranium mine! From Uranerz Energy's July 20, 2011 news release, "The receipt of the NRC Materials License, the final step in the NRC licensing process, marks a very significant milestone achieved by the Company and represents the culmination of over four years of effort which was spearheaded by Mike Thomas our Manager of Environment, Health and Safety," stated Uranerz CEO & President Glenn Catchpole. "I congratulate our entire staff for their valuable contributions through the permitting process. The hiring of new staff is now underway and the Company is focused on the development and planned operation of the Nichols Ranch ISR Uranium Project." From Uranerz Energy's January 4, 2011 news release, "... This is a very significant event for our company, and it is one of the first new commercial uranium Permits to Mine issued by the WDEQ in almost 20 years, stated Uranerz President and CEO Glenn Catchpole. It gives Uranerz the State's approval to construct and operate an ISR uranium mine and demonstrates, through no negative comments being submitted to the WDEQ during the public comment period, that the citizens of Wyoming support uranium mining as long as operations follow the State's comprehensive environmental laws and regulations. ..."
In-Situ Recovery ("ISR") Uranium Mining has several advantages compared to hard-rock mining. Typical hard-rock projects take many years to develop and are very capital intensive. For example, a diamond explorer I have followed closely since the mid 1990's recently released a positive Feasibility Study that projects ore production could start by 2017. This assumes timelines are now met in designing, permitting, infrastructure and raising around $2 billion in capital costs. The economics of this 20-years to production finish line is especially sensitive to diamond prices and grades, currency exchange rates, capital and operating costs, plus market conditions and interest rates if debt is needed. This is why most small-cap explorers do not end up producing their own discoveries; instead having to partnership or joint venture to share the costs, risks and rewards, in order to get a mine done. However Uranerz Energy is not your typical mining company. URZ has indicated total mine capital costs of approximately $35 million. No holdups there as the company currently has $44 million in the treasury and no debt. Uranerz Energy has indicated construction of its first ISR Uranium Mine will take only 12 to 15 months. With its key NRC Material License and WDEQ Permit to Mine now in hand, and the Deep Disposal Well permit from the Wyoming Department of Water Quality anticipated prior to production, this puts the company on target to start producing commercial U3O8 Yellowcake at Nichols Ranch sometime around Q3-Q4 2012. Now that both key state and national permits are in place, and with mine construction costs fully funded, how much ownership of the Nichols Ranch Project had to be given up to get to this point? Answer: Uranerz Energy still owns 100% of the Nichols Ranch property and mine, including adjacent Hank, Collins Draw and North Rolling Pin properties. If you are thinking to get this far alone that there must be a gazillion shares outstanding, my screen shows only 76,738,574. Uranerz Energy has reported NI 43-101 uranium resources for 7 of its over 30 uranium projects in the Powder River Basin area of Wyoming, U.S.A. The table below shows the Company's total estimated uranium resources as of October 14, 2010, on those seven projects. Uranerz Energy has already qualified over 19 million pounds of U3O8 in the Measured & Indicated and Inferred categories. With only 7 out of 30+ uranium projects explored so far, the company's resources could potentially grow by multiples of this. On May 10, 2011 Uranerz Energy announced their 2011 Powder River Basin Drilling Program. As additional uranium resources are potentially qualified at the company's +23 other nearby uranium projects, this additional feedstock could expand the economic size, cost efficiencies and overall value of the entire project, and should also extend the Nichols Ranch mine life significantly. These additional resources can potentially be added to the company's existing permits and produced under the license amendment provisions. Uranerz Energy's In-Situ Recovery mine-design is a relatively inexpensive and efficient mining process. Low capital costs, low operating costs and low labour costs. Compared to other mining methods, ISR is profitable on even lower grade uranium deposits. ISR mining is also safe and environmentally friendly - no open pits or underground shafts, no waste rock or toxic tailings pond. Essentially a leaching agent of oxygen and baking soda is added to the groundwater and injected through wells into the ore body and then returned for processing. Similarly, nuclear energy is the safest, cleanest, most efficient and lowest cost form of commercially available energy. Nuclear power has been around since the 1950's and provides 16% of the world's electricity. The IAEA shows 440 reactors in operation worldwide. However, most opponents of nuclear energy can point to only three reactor accidents - Three Mile Island in 1979, Chernobyl in 1986 and Fukushima in 2011. Japan's nuclear crisis may have more to do with faulty equipment and outdated plant design, than the 9.0 earthquake on March 11, 2011. Even three nuclear accidents are too many, but the point is that politicians and the media should provide factual research instead of stroking misguided fears. Uranium prices were above $70 a pound and trending higher with oil, then around $100 a barrel, just before Fukushima. U3O8 is now down to $55 although oil hasn't budged much from the century mark. The fundamentals of growing energy demand plus hundreds of additional nuclear reactors to be built support uranium's long-term uptrend, despite the Fukushima related sell-off. Uranerz Energy already has several drill rigs onsite and has been making mine preparations for months in anticipation of receiving its NRC Materials License that is now in place. From the July 20, 2011 URZ News Release, "Construction activities will commence within the next few days to take full advantage of the summer/fall construction season in Wyoming. Uranerz has already initiated procurement of ion exchange equipment, including three sand filters and six resin loading columns. Well-field installation equipment is also on order including a cement silo, cementing pressure pump units, mixing trucks and well casing. The local electric utility has recently completed construction of a substation in close proximity to the Nichols Ranch project which will service the Company's mining operations in the Powder River Basin as well as other industrial projects in the region." The central processing facility at the Company's Nichols Ranch ISR Uranium Project has been licensed for a capacity of 2 million pounds per year of uranium (as U3O8). 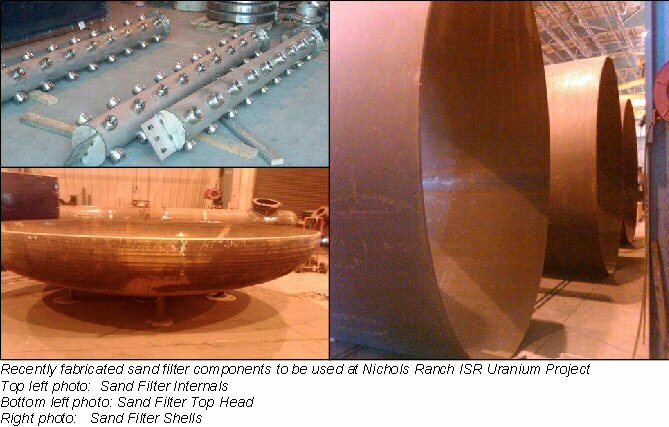 It is planned that this facility will process uranium-bearing well field solutions from Nichols Ranch, as well as uranium-loaded resin transported from the Hank satellite facility, plus uranium-loaded resin from additional satellite deposits that may be developed on the Company's other Powder River Basin properties. One might compare resource plays to a book, becoming clearer as you advance through each chapter. Anticipation and participation tends to build with each successful exploration, discovery, qualified resource, feasibility, permitting, financing, construction, production and operation stages. However most financial analysts and institutional investors avoid speculative exploration companies and won't consider them as investments until economic production and near-term cash flow can be reasonably assessed. Now that the probabilities of Uranerz Energy becoming a uranium producer are essentially de-risked, many new eyes may want to take a look at URZ. One might also find it interesting to compare URZ’ current USD $243-million market capitalization to any publicly traded uranium producer. Uranerz is not yet a uranium producer but is now the closest near-term producer. URZ may also get a premium for being a US domestic producer as the geopolitical risks are low. The company has already entered into long-term uranium sales contracts with two of the largest nuclear utilities in the U.S., including (NYSE: EXC) Exelon Corp.. The finish line is now in sight for Uranerz Energy to be able to remove the words “Near-Term” in front of “Uranium Producer” – having all permits for mine construction, all NRC permits for uranium production, and with funding in place. We look forward to regular URZ construction, drilling and analyst updates.